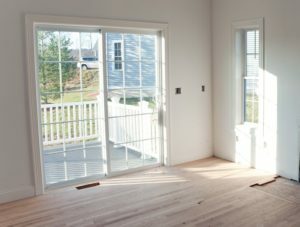 Why the need for patio door glass unit repair? Safety glass is required on all patio doors. Safety glass prevents the window from cracking. A cracked patio door could split off into large chunks of glass and cause serious injury. Safety glass cracks into little pieces of glass that prevent injury but cause large messes. A double pane glass unit for patio door is two pieces of safety glass, separated by a metal spacer, and sealed together to form a unit. In between the two pieces of safety glass, an air pocket is formed. This air pocket provides insulating value. Since a double pane unit is made of two pieces of safety glass, this means either one or both sides of glass can break, or develop defects. If the interior side or exterior side of safety glass breaks, the only option to repair a double pane safety glass unit is to measure the glass, manufacture a new double pane safety glass unit, and swap the old double pane safety glass unit out for the new one. You are never left without a patio door. What is Patio Door Glass Unit Repair? The only option to repair broken or fogged patio door glass unit repair is to measure the glass, order new safety glass, manufacture a new double pane glass unit, and switch the old double pane glass unit out for a new one. You are never left without a patio door. It is not possible to replace just one side of the glass unit. The seal holding the two pieces of safety glass together is very strong; attempting to cut this seal will break both pieces of glass and is very dangerous for our workers. Repairing a patio door glass unit repair is just as effective as replacing the whole door, but less expensive, takes less time to install and is less messy. This saves you time, money and hassle! When can my patio door glass unit be repaired? A patio door glass unit repair normally takes 7 business days for inspecting, ordering, measuring and repairing. Where does Lightning Glassworks & Screens offer patio door glass unit repair? How does the patio door glass unit repair repair process work? First, contact us. We’ll schedule a time during business hours, usually within 1 day of your call, to inspect & measure the patio door glass unit repair that need repaired and give you a quote. Once you give approval, we’ll measure the door, order the safety glass go to our shop and manufacture a patio door glass unit. We’ll then schedule a time to install the new double pane glass unit. You may or not need to be home for patio door repair. Patio door glass unit repair can sometimes be completed from the outside; homes and businesses vary. We’ll work with you gain entry into the residence, and work according to your schedule. We work with lock boxes, tenants, homeowners and property managers frequently and understand how to schedule to meet your unique needs. If you can give us approval on our initial visit to measure, we can make arrangements to complete the repair fully from the outside by completing the initial cutting out of the door on the first visit. Once we arrive at your residence or business, we’ll ring the doorbell, bring in our tools, cut out the old glass patio door unit, install the new double pane unit, complete the repair and clean up any mess. After your patio door glass unit is fully repaired, we bill you on-site. We accept check, cash or credit card.